If Apple releases a "larger, screen-detachable" iPad in the near future it could help invigorate the once-quiet 2-in-1 tablet market, IDC suggested in a Wednesday research report. The segment is forecast to grow 86.5 percent year-over-year in 2015 to 14.7 million units as it overcomes a number of problems that were previously holding it back, said a program director at IDC, Ryan Reith. He argued that many older models were expensive, unattractive, and/or saddled with Microsoft's unpopular Windows 8. The number of vendors has grown from 14 to 40 in two years though, helping to push prices down. Along with a bigger iPad, the launch of Windows 10 and more Android-based 2-in-1s could also mark a turning point, Reith said. Another potential aid may be businesses, which have typically veered away from tablets of any kind. "It will take some time but we expect that once IT departments are done evaluating Windows 10 and the awaited iPad Pro, they will start migrating some their portable PC and tablet installed base towards 2-in-1's," said IDC's tablet research director, Jean Philippe Bouchard. Apple is believed to be working on a 12.9-inch iPad commonly referred to as the iPad Pro, which should have features such as a pressure-sensitive stylus and unique iOS improvements. No evidence of a detachable keyboard has surfaced, although that could be a possibility if the device has a rumored second connection port, whether based on Lightning or USB-C. The average selling price of standard "slate" tablets, like current iPads, is expected to fall under $300 this year thanks to a proliferation of 7- to 8-inch generic models targeting markets like Africa and the Middle East. Nevertheless, IDC is forecasting that the combined 10-inch-plus and 2-in-1 tablet markets should rise from an 18.6 share last year to 39.5 percent by 2019. In the short term, the overall tablet market is predicted to drop 8 percent in 2015 to 212 million units. 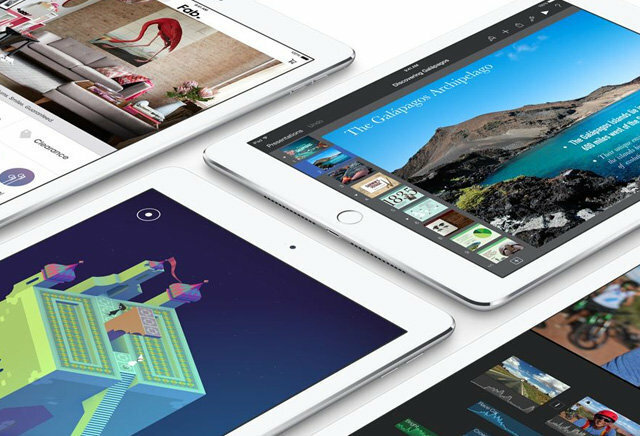 Apple's own iPad sales have declined consistently in the past several quarters, which has commonly been blamed on things like slower update cycles for tablets and the popularity of "phablets" like the iPhone 6 Plus, which can serve many tablet functions while offering the benefits of a phone.